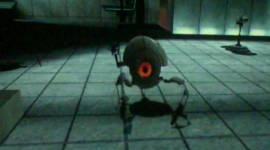 The Walking Turret was a Sentry Turret variant that was cut late in the development of Portal. The Walking Turret was first revealed in concept art during the PotatoFoolsDay ARG in 2011. Its design is similar to that of the standard Sentry Turret, with a spherical body, an orange colored "eye", and a single side-mounted gun. In the concept art, it can be seen exiting a blue portal, implying that it may have been able to follow players throughout test chambers through their linked portals. The Walking Turret could also collapse into a "fling, or ball pose", which presumably would allow it to fling itself through portals. This pose could also have been its idle pose, possibly activated by the player through some form of trigger or proximity. Valve animator Karen Prell explained that the Walking Turret was cut because it, "didn't work [well]" as a game mechanic. Walking Turret concept art from the Portal 2 ARG. The Walking Turret, alongside one in it's "fling" position. An early Portal Spawner can be seen in the background. The Walking Turret fully opened up. This page was last modified on 3 June 2016, at 20:53.